The title of this post is the same as that of an article in Issue 873 of Rail Magazine. I was moved to send this letter to the magazine. Was this title on page 17 of Issue 873 serious or an ironic joke? I am a seventy-one-year-old Ipswich fan and Season Ticket holder, who lives in London, within walking distance of Liverpool Street station on a fine day. Over the last six or seven years, I have been unable to see Home matches as often, as I would like, as on perhaps half of weekend match days, there have been no trains running on the Great Eastern Main Line, due to the constant maintenance. Or is it a complete rebuilding for 140 mph trains? To be fair, I have occasionally used the replacement buses, but the problem is that they make the journey well over an hour longer. So on a match day, there is no time left for anything else! I had to watch the two Ipswich-Norwich matches on television, as on both these Sundays to get to the match by mid-day was impossible and probably needed an overnight stay! I accumulated my very adequate pension pot, by writing software to schedule resources on complicated projects. Surely, Network Rail, Greater Anglia, the Premier League and the EFL can agree a plan that is better than the current shambles. Greater Anglia surely have the means to improve the situation arriving in their depots. Pairs of four-car Class 755 trains could run reduced services via Cambridge. If the line is blockaded between Ipswich and London, then a direct service could be run between Norwich and London via Ipswich and Cambridge. If the line is blockaded between Ipswich and Norwich, then a direct service could be run between Norwich and London via Cambridge. Although, this has nothing to do with football, pairs of Class 755 trains would also be useful for running a service between Peterborough and London, when the Southern section of the East Coast Main Line is closed. I shall add a few extra notes to this on-line version of the letter. Points about Class 755 trains. Capacity of a pair of Class 755 trains is 458 seats, as against the 514 seats of the current stock. The interior will be suitable for services between London and Norwich. The trains and their crews will probably be certified for all of Greater Anglia’s Network. A single train is eighty metres long and a pair would be 160 metres. The trains should fit all important main-line stations on the Greater Anglia Network. I also suspect that these trains could run into Kings Cross station, either using the East Coast Main Line or the Hertford Loop Line. They are blockade-busters par excellence. The title of this article, is the same as that of this article on Rail Technology Magazine. I hope this is actually the case. I’ve had enough of rail replacement buses, when trying to get to football at Ipswich on a Saturday. For at least the last three years, I’ve probably seen more away matches, than those at Portman Road. Three hours each way to Ipswich, effectively means, the only pleasurable thing you do is see the match. This work has probably hit attendances at both Norwich and Ipswich. I’ve renewed my season ticket fort next season, but if it is as thin on home matches as this one has been, it will be my last season of travel. What puzzles me, is why can’t Network Rail adjust their work schedule, so that at least important matches like the two Derbies have trains? But then you wouldn’t rate Network Rail highly for Project Management! This was a dreadful day as we lost to Norwich. But what made it worse was the tediously long journey both ways due to the work on the Great vEastern Main Line. I evetually got back into London at nine o’clock, after a match that finished at four, to find that all my normal routes home were suffering from engineering works. This match was a tale of two goalkeepers. 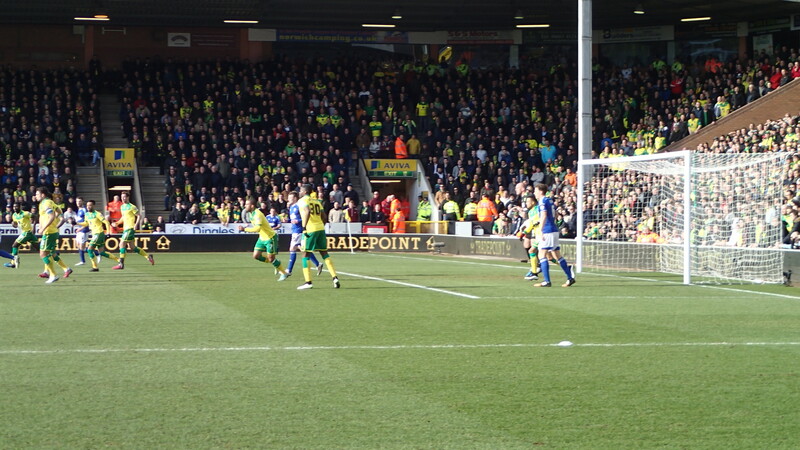 Our one made a mistake that led to the goal and Norwich’s keeper was sound throughout. It could be worse though – We might all be Fulham supporters. As an Ipswich suppoter, I hate to say it, but Norwich City have given me one of my best football moments. It was the 18th February 1967 and C and myself went for a drink in a Greenall Whitley pub, called something like the Royal Oak on the East Lancashire Road (A580) by St. Helens. C wasn’t into football much, although she used to go to Barnet as a child with her father. But she was so amused at a table full of disgruntled Manchester United fans, crying in their beer, after Norwich had beaten them 2-1 in the fourth round of the FA Cup. She actually remembered this incident a few months before she died. I’ll never forget it! 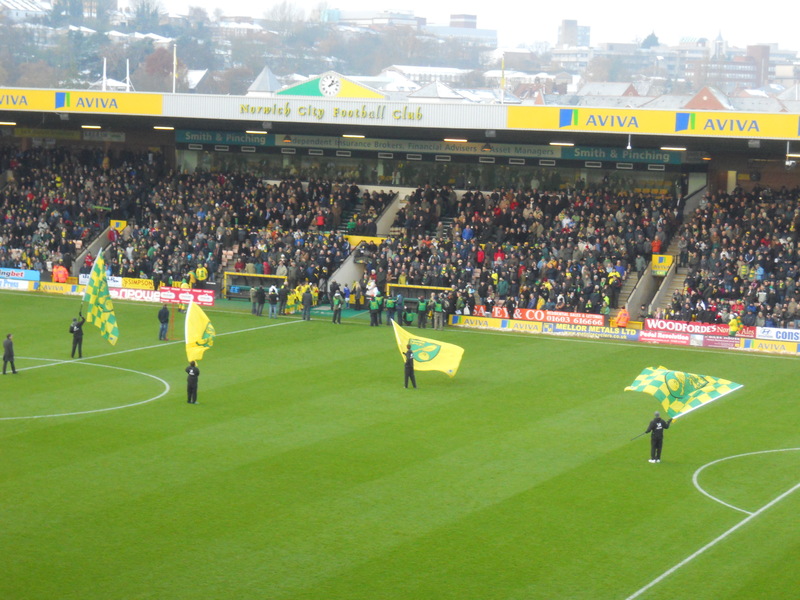 I’d only been to Carrow Road once before and that was with my late youngest son to see Norwich City play the team he supported as a twelve-year-old, Liverpool. The ground then was fairly ramshackle and you can see now that it has been completely modernised. What the flags were about, I don’t know! I will say little about the football, except that Ipswich self-destructed and I don’t believe they’ll do any better until someone takes charge of the defence. Damien Delaney may have scored but he needs someone to help him out. We need Gareth McCauley back in the team as soon as possible to put some sense and backbone there. I’ve just ordered the taxi to take me to the station to get my train to Cambridge. The weather doesn’t seem too bad, but it’s a bit cold. To say the least. The train was also on time at Ipswich and is just approaching Needham Market. I go to quite a few Ipswich Town away matches, but I’ve never seen them at Norwich. This year though, I will be there, as they have what is known as an Alternative Priority method, which allocates a ticket to supporters, who have been to a given number of away matches. What a sensible use of their ticket computer system. I suspect that they are not alone in doing this!